DR ELLIE CANNON: Am I at risk of a deadly mix-up? I was given a blood-thinner to take after a hip operation, but the label on the box says it’s not to be used if you are over 65 – I am 77. It also says it can’t be taken with ibuprofen, which I was also given after being discharged from hospital. What’s going on here? Shockingly, 712 patients die every year due to avoidable errors in taking medicines they have been prescribed. This is why it is important that patients flag up if there is a discrepancy between instructions given by doctors and the labels. The label printed on a medication should come from instructions on the prescription. This will be written by the doctor and transcribed by the pharmacist. It should direct exactly when, how and how much of a drug to take. 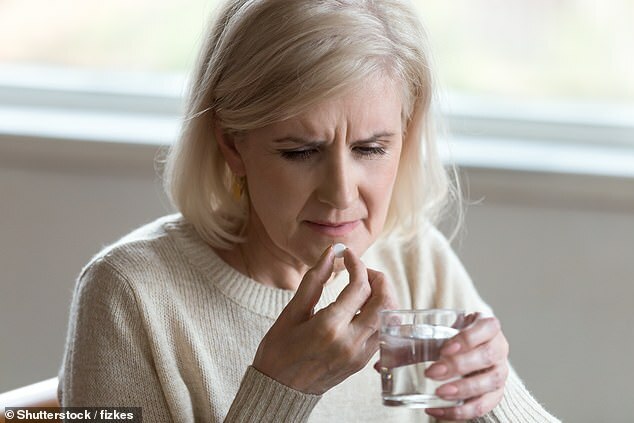 It is also good practice for doctors to indicate on those instructions what the medicine is for, such as ‘One tablet orally three times a day for pain relief’. It is possible in some situations that this is not in keeping with what the medicine may be intended or indicated for, and a doctor may be prescribing out of the national formulary guidelines. However, this does not mean the prescribing is not safe or incorrect. For example, there may be protocols that are followed where the medicine is used above the age range or at higher doses. This is confusing for patients when the labels do not match up – the advice would be to clarify with your doctor or pharmacist. Regarding your second point, some drugs interact catastrophically and are absolutely not to be given together. For others, it is a relative warning to exert caution and stick to low doses. It very much would depend on the background health of the patient and doses being used, and again, this is to be discussed with a doctor. Are GPs paid to prescribe medicines? If so, how much? And how can I trust they have my best interests at heart? There is a widely held belief that GPs are paid to prescribe drugs. But this isn’t true. We do not – and cannot – receive financial incentives to prescribe medicines, or accept any inducement to influence prescribing. It is a rule strictly enforced by the General Medical Council. And drug firms are prohibited from offering any kind of financial incentive. So where has the perception that we do come from? Well, since 2004, GP practices mostly work under a scheme involving target payments, known as the Quality and Outcomes Framework. This encourages us to meet targets for things such as cervical screening and child immunisation. This does include some prescribing – statins for those at very high risk of a heart attack, blood-thinners for those at risk of clots, for example. But this cannot lead to unethical or over-prescribing: a GP cannot accrue extra money by dishing out drugs indiscriminately. We still only prescribe medication based on sound clinical evidence. Note also that GPs are paid not to prescribe. A practice accrues income by reducing unnecessary prescribing of antibiotics, sleeping tablets and certain expensive brands of inhalers. Next time you’re in your GP clinic, don’t be surprised to hear the doctor talk about wee and sick, rather than urine and vomit. Health chiefs have ordered doctors to use language that patients understand. The NHS website will also be reflecting this. I understand the logic, but surely it would be far better to improve health literacy for everyone. The ruling goes against what many charities are doing, in encouraging patients to understand proper anatomical terms so that they are equipped to speak accurately and promptly about important symptoms.